MR Online | What happens when the ‘alt-right’ starts believing in climate change? What does it mean for whites if climate change is real? 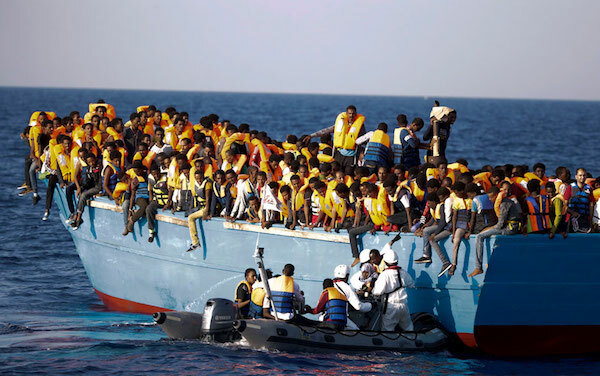 “The population explosion in the global south combined with climate change and liberal attitudes towards migration are the single greatest external threat to Western civilization,” AmRen wrote. [It’s] more serious than Islamic terrorism or Hispanic illegal immigration. The magazine’s editor-in-chief, influential white nationalist Jared Taylor, doubled down on AmRen’s position in an email to Jewish Currents. “If continued global change makes the poor, non-white parts of the world even more unpleasant to live in than they are now, it will certainly drive more non-whites north,” Taylor said. I make no apology for…urging white nations to muster the will to guard their borders and maintain white majorities. Among conservatives, climate realism is still a minority view. Republicans are largely deniers, doubters, or cynical backers of the fossil fuel industry. Only 28 percent of white Christians, who overwhelming voted for Trump in 2016, believe in anthropogenic warming, according to a Pew Research Center poll. Trump himself, who once called climate change a “hoax,” not only continues to deny the existence of global warming, but has also pulled the U.S. out of the Paris Climate Agreement, opened huge tracts of ocean to oil and gas exploration, and stuffed his administration with climate deniers and champions of the fossil fuel industry. The populist right, in the U.S. and elsewhere, seems primed to accept this kind of thinking. The migrant crisis in Europe, sparked by conflicts in the Middle East and Northern Africa (conflicts rooted in histories of European colonialism, extractive capitalism, and Western military intervention), has been met with a vicious and sometimes deadly xenophobic backlash. There have been good faith efforts to link the Syrian war to climate change. But it’s easy to picture this work getting co-opted by nationalists looking for excuses to halt immigration. Similarly, North Africa from Morocco to Nigeria has been called an “arc of tension”—a band of earth so battered by drought, famine, desertification, internal conflict, and centuries of colonial and neo-imperialist violence that it’s ready to snap, pushing more people north. I doubt it would take much for climatic shifts in North Africa, a region already seen as dangerously other and tarred by the right as a terrorist “breeding ground,” to serve as pretexts for far-right efforts to close borders and boot migrants seeking shelter from the global storm. In five short years, right-wing populists have marched hardline immigration policies from the periphery of mainstream U.S. conservatism to the Oval Office. Now they’re talking about climate change. If their influence persists, it is not hard to picture rank xenophobia—in the form of stricter immigration quotas, more militarized borders, and tighter restrictions on women’s fertility—taking over the federal climate agenda. The results would be nightmarish. If the left thinks a just response to climate change is still possible, it should take notice of these nativist believers, and prepare to push back.